It is time to get dressed to go to school but one little girl (and her very cute tortoise) just cannot make up her mind as to what to wear (anybody with a daughter will definitely be able to relate to that!). Nothing is right! 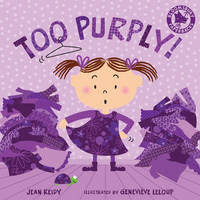 It is either too purply, too itchy, too zippery, even too polka-dotty! Will she ever find the perfect outfit, and will she ever make it on time for the school bus? It is adjective-galore in this colourful, funny getting-dressed adventure. 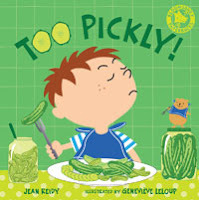 However, don’t be fooled into thinking this is just another toddler book about learning new adjectives. There is so much more about this book. Yes, the text is sparse but the adjectives chosen (and made-up for some of them, but that only makes it more hilarious!) make it more original than other books in the same register. The rhyming gives real substance and comic value to the story. 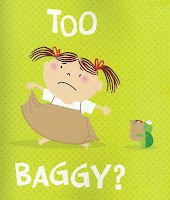 My daughter, who is in Reception and learning to read, found it a great little book to practice on. 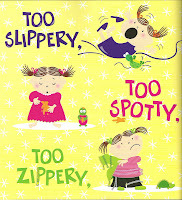 The illustrations work wonderfully with the text and really add to the originality of the book. The little girl has some great facial expressions. From the striking (and quite hard to look at) Too Stripy to the totally over the top Too Matchy pages, each page is original, funny with has plenty of detail to pour over (including the hilarious little tortoise).